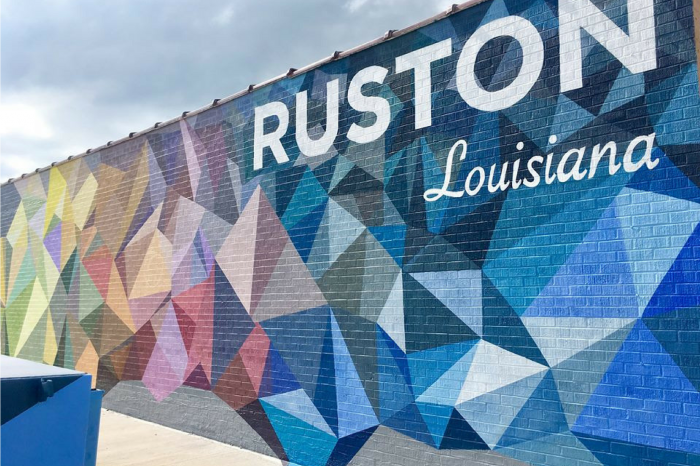 Ruston's art and cultural community is booming, with vibrant and exciting backdrops for photos all around the city! Location: At the corner of North Vienna and Alabama, on the back of the 1938 Rainwater Building, across from the Dixie Center for the Arts! Be sure to take a closer look at all of the geometric shapes hidden throughout this mural. Location: On South Trenton street on the side of the Louisiana Center for the Blind's woodshop. 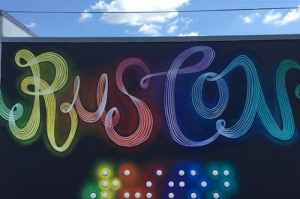 This mural features enlarged braille beneath it to symbolize Ruston's relationship with the Center for the Blind. Location: Drive through the underpass off of Woodard Avenue between exits 84 & 85 on Interstate 20 and across from the water tower! This mural represents Rock Island Greenway, Ruston's shared-use walking, running, and bicycling path and linear park. Location: On the outside wall of the Ruston Farmers Market building (220 E Mississippi Ave). RFM brings opportunities to our farmers and other vendors, to provide healthy, local food choices to our community. Stop by on Saturday mornings! Feel free to contact Experience Ruston (318.255.2031) if you need help locating any of the above murals! Don't forget to share your public art adventures with #RustonLA too.